OnePlus 6T launches with the flagship features in the Indian market, this is the price. 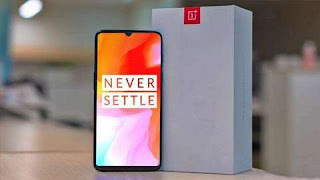 OnePlus, the leading smartphone manufacturer, has launched its new smartphone, OnePlus 6T. The starting price of the new phone is Rs 37,999. The company has loaded the new smartphone with three variants of 6 GB / 128GB memory, 8 GB / 128 GB memory and 8 GB / 256 GB of storage. The phone will start matching the company's OnePlus website and Amazon India from 12 am on November 1. On November 3, it will be available at the OnePlus Store, Reliance Digital and Croma Center. OnePlus 6T came with three variants The phone's 6 GB / 128GB memory variant is priced at Rs 37,999. The variants of 8 GB / 128GB memory variants of Rs. 41,999 and 8 GB / 256 GB have been priced at Rs. 45,999. The smartphone features display fingerprint technology, 6.41 inch display and 3,700 mAh battery. Petlow, founder and chief executive officer of OnePlus, said that we constantly challenge ourselves to get the best experience for the people. Whatever we do is right, whatever we have to do. One Plus 6T run on the Android 9.0 Pie operating system has Qualcomm Snapdragon 845 processor. The phone has 128 GB of internal storage with 6 GB and 128 GB internal storage with 8 GB. The phone has 16 MP and 20 MP rear camera. Apart from this, it has 16 MP front facing camera. The phone has Bluetooth, Wi-Fi, 4G VoLTE and GPS for connectivity. Talk about the design of the phone, its embraced glass design has been given. One Plus 6T is the longest one launched earlier than the 6th. Before launching the phone, two colors were shown in the official marketing image - Mirror Black and Midnight Black. There is a finger scanner with a dual camera. The company has named it 'Screen Unlock'. Dash charging support is also provided with the 3700mAh battery with dual rear camera setup.